21-May-2001 -- We joined a 4x4 trip to Baja organized by Ecological 4Wheeling and had not planned to visit any confluences. We were aware that there are unvisited confluences in Northern Baja, but we did not expect to have time to visit any on this tour. When we discussed the itinerary for the last day I noticed that we would get within 5 miles of this confluence according to the AAA map. I didn't bring any topo maps on the trip not expecting to need any. Fortunately another tour participant had some topos and we concluded that the actual route we would take should take us within 3 miles of the confluence. The trip leader indicated that there are many dirt roads in the area which did not seem to appear on the topos. This was good and bad news: good because we might be able to drive close to the confluence and bad because all these unmarked roads also make it easy to get lost if one does not know the area. So we decided to go towards the area and then I would decide if we split from the group to find the confluence or just make this trip a scouting trip for a future visit. Once we got closer it turned out that the tour would take lunch 10-15 miles from the confluence, so we decided to explore for about an hour and then try to meet the tour again. I then asked the only other participant with a GPS (Al Walter) whether he would like to join us. Al agreed and that was lucky for us, since he knows the area. So we split from the group and found a road pointing in the general direction of the confluence. We followed the road for about 3 miles only encountering one rough spot where we switched to 4x4. The road led us into a very green valley with large trees where the road took us within 50m of the confluence! 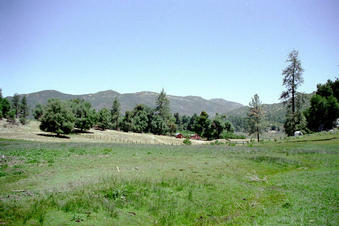 There is a Rancho close by and sheep and horses were grazing around the confluence. This is definitely not what we had pictured for Baja, the usual picture of Baja being desert and beaches. We took our pictures, went back to the main road and headed north to the Parque Nacional Constitucion De 1857. Due to Al's knowledge of the area and with instructions via CB from the group we were able to find them still at their lunch spot. The roads from the south in the area are mostly 2x4 with high clearance. We had to cross a couple of creeks one of which brought the water almost up to our doors. From the North the area can be reached by passenger cars if one drives carefully ... our group pulled a passenger car out that had gotten stuck in some sand.